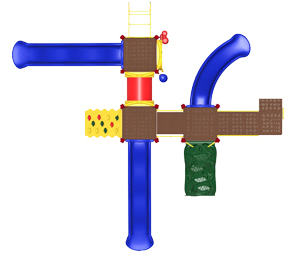 Boulder Point features entry points via Rung Climber, Vine Climber and Deluxe Climbing Wall or ground access stairs, allowing one to race around with friends, scale a mountain and reward their endeavors by sliding down the fun Curve and Wave Slide. At the ground level Boulder Point incorporates musical components to inspire the budding musician. 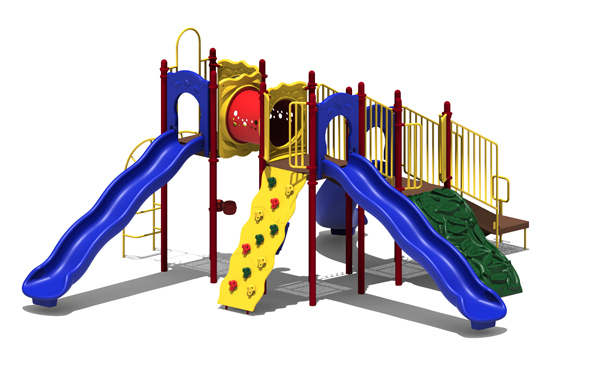 UPLAY-079-P - 27'8" x 32'10"
UPLAY-079-N - 27'8" x 32'10"
The Boulder Point Playground Structure embraces the natural instinct for kids to climb. It provides a safe, open space for kids 5-12 years old to build strength, explore and create friendships.